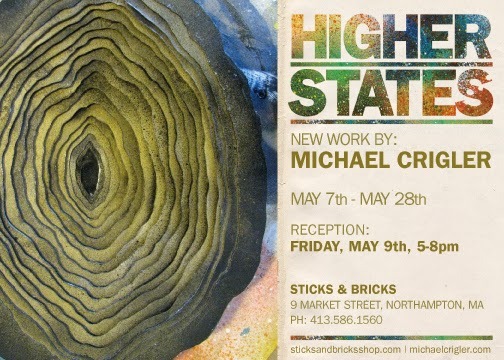 In conjunction with Northampton’s Arts Night Out, on Friday May 9th, 2014 Sticks & Bricks will host a gallery reception for local artist, Michael Crigler from 5-8pm. Refreshments will be served, and music will be heard. Crigler’s work will be on display and for sale until May 28th. Higher States is like an explosive dream, or a weirdly detailed, ever-so-slightly timeworn memory thereof. Each image seems hauntingly familiar, yet hypnotically exotic, evoking some internal emotion connecting the viewer to the cosmic void, vibrant star nebulas, birth and earthy formations. In this new body of work Crigler is exploring the cosmic evolution that is unfolding in the universe. This visual journey dives into realms of new physics, energy and the interconnectedness of all things. Agate Study (1) by Michael Crigler inner light of all, making images that can work as 16 x 16, Mixed Media on Paperportals to remind us of our true nature." Michael Crigler is a wild-creative. When he is not out roaming the forests wildcrafting plants for medicine for his work as an herb­alist, he is in his studio working as an artist, poet and designer. His work is heavily influ­enced by cosmic energy, healing, connection of all things and his Cherokee and early Pow­hatan roots which trace back to Chief Pow­hatan and his daughter Pocahontas. His work has been exhibited in North America, Europe, Canada, Australia, New Zealand and Japan. He currently lives with his wife Lauren in Western Massachusetts.